Fiona Concannon BA Hons, MFA, grew up in Spiddal, Co. Galway - an area renowned for it's outstanding natural beauty. Fiona left her much loved Spiddal to finesse her craft and studied Fine Art Painting at a variety of institutions, including the Limerick School of Art and Design, GMIT, Crawford College of Art and Design, The University of Ulster ad The National College of Art and Design. In addition to her formal study, Fiona spent some of her formative years as an artist painting in England and Australia, where she began to experiment with the use and effects of colours. Her work continues to explore the symbiosis between light and colour - and the resulting effect. Closer to home, Fiona has trailed the mountains, lakes and coastline of Connemara, in pursuit of the unpredictable splendour of the Irish landscape. 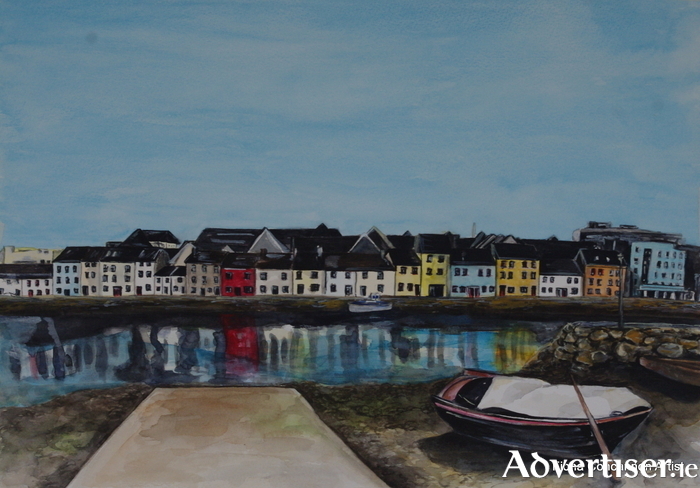 While teaching adults in Galway, Fiona found herself encouraging her students to paint local scenes and then decided to take her own advice! Family and friends who live abroad, were always telling her that they would love to buy an affordable piece of art that would remind them of home, and so Fiona started off by painting 'The Long Walk'. Fiona received great help and support from the Local Enterprise Organisation in Galway City, Muireann Ní Dhroighneain in Údarás na Gaeltachta, and is a member of 'Made in Galway'. Capturing the natural beauty of her surroundings in the West of Ireland, Fiona's artwork has been described as warm, vibrant, colourful, fun and a little bit quirky. Fiona decided to make a living out of something she feels passionate about. She has lived in a lot of places but has always been drawn back to Galway.